This recipe is up due to popular demand. Haha. When I posted a pic of what I was making on Instagram, several people asked for the recipe so here it is! Most of my life I’ve just chomped on cashew nuts or added them to stir fries but this year I’ve been experimenting and coming up with recipes using them. I was inspired by Ghanian peanut soup though that has chicken and garden eggs. This spicy cashew soup is a delicious winter warmer with a good kick. The recipe calls for raw cashew nuts, roasted cashew nuts and cashew nut butter! Feel free to just use one of those only – the soup still tastes great but I find that having the different textures/degrees of cooking adds depth to the flavour. I’ve never been served plantain/dodo in soup but when I tried it just worked. Plantain was also a childhood favourite (still is) so this is happy soup all round for me. Sweat the onions in 1 tablespoon of coconut oil for approximately 5 minutes on a low to medium heat in a pot. You don’t want the onion to get any colour at all just soften. Finely chop the garlic, ginger and chilli (or use a food processor) and add to the onions. Sweat for another 5 minutes. While the onion mixture is sweating, dry pan roast half the raw cashew nuts. Let the nuts cool then grind them with a mortar and pestle. You want a mixture of ground nuts as well as a few small nibs. Do the same with the remaining raw nuts. Add the sweet pepper, cherry tomatoes and roasted cashew nuts to the pot. Mix the stock cube in 1 litre of water then pour in to the pot. Stir in the cashew nut butter. Bring to the boil then simmer soup at low heat for 30 minutes. To make plantain croutons: Heat oven to 200˚C and place the baking tray inside. Dice the plantain in approx 1 cm cubes. When baking tray hot, wipe with 1 tablespoon of coconut oil then place the diced plantain on tray, season and cook for around 10 minutes until cooked. When the soup is done you can blend it. Personally I prefer texture and chunks in my soup. To serve, add the plantain croutons and garnish with cherry tomato pieces, roast cashew nut and spring onions. Squeeze lemon juice onto soup just before serving. Any one else love cashews or cashew nuts as much as I do? I’ve decided to add this to the No Croutons Required soup challenge which you can read about here. Oh yum, this looks delicious. 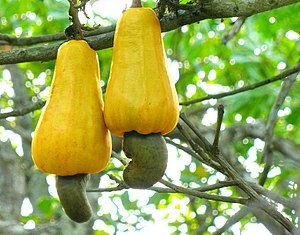 I never knew what a fresh cashew tree/fruit looked like – it is quite amazing. Thank you for sharing that and such a wonderful soup. I’ve seen fresh cashew twice in 20 years so get very excited! It’s been 6 years since I tasted a fresh one. You’re welcome – i hope you make and enjoy! I like everything in this luscious-looking soup. Thanks! Thank you – it really is scrumptious! Thanks Lucy – just spreading the cashew love!